depth, 6.1, with depth, 6.6 at 51° 27´·031N., 0° 20´·564E. depth, 7.8 at 51° 26´·891N., 0° 23´·422E. 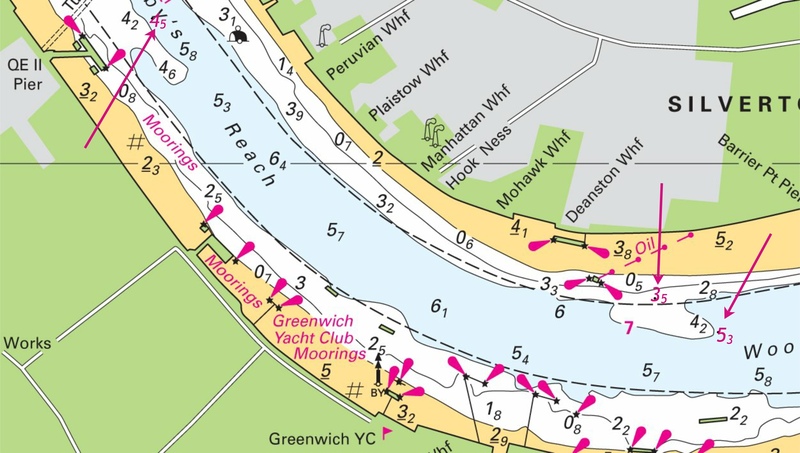 Delete depth, 6.9 close S.
Two increases of depth in Gravesend Reach! Fl.G.3s Gallions at 51° 29´·967N., 0° 04´·447E. New starboard hand buoy at Gallions Point in Gallions Reach. depth, 5.1 at 51° 29´·769N., 0° 01´·326E. Delete depth, 5.4, close E.
depth, 5.4 at 51° 29´·765N., 0° 01´·460E. Delete depth, 5, close SE. Two changed soundings on the south edge of the main Thames channel east of Greenwich. depth, 8.1 at 51° 29´·274N., 0° 27´·924E. 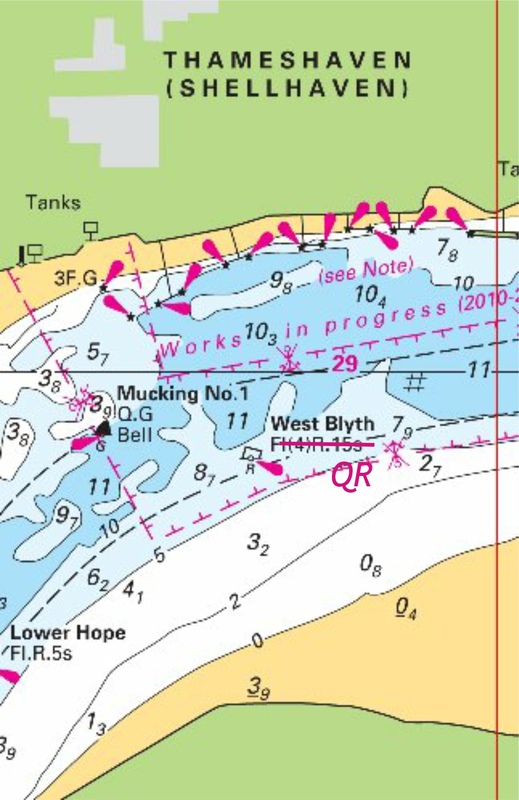 One reduction of depth close to the edge of the main channel just below the Lower Hope port hand buoy. ENGLAND - East Coast - NM Block. Mooring buoys. Dolphins. Obstructions. Lights. Fouls. the accompanying block, centred on: 51°27´·1N., 0°24´·2E. with Obstn at 51°27´·037N., 0°21´·192E., and 51°27´·042N., 0°21´·117E. UKHO Charts: 1196 and 2151. A collection of eclectic changes on waterside structures in Gravesend Reach. 2. Adjacent to the Tilbury Cruise Terminal: a diverse collection of changes prompting reaching for the Symbols book! 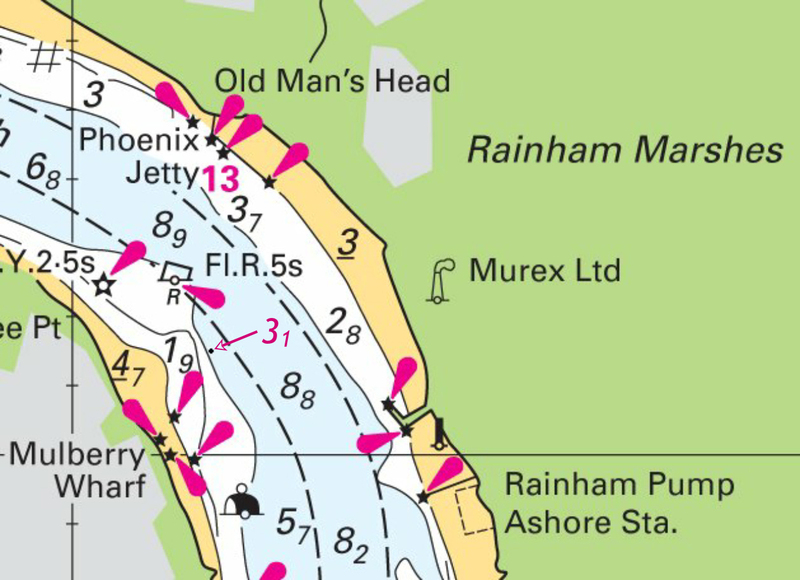 This involves changing two mooring buoys for a FOUL, a minor light for a Dolphin, a Dolphin for a minor light and a ruin dolphin for an Obstruction! ENGLAND - East Coast - Fog signal. Horn(10)20s, and associated symbol, fog signal at 51° 30´·352N., 0° 04´·509W. UKHO Charts: 3319 and 3337. Delete of the Fog horn on Tower Bridge. depth, 4.9, and extend 5m contour NE to enclose 51° 30´·246N., 0° 00´·559E. 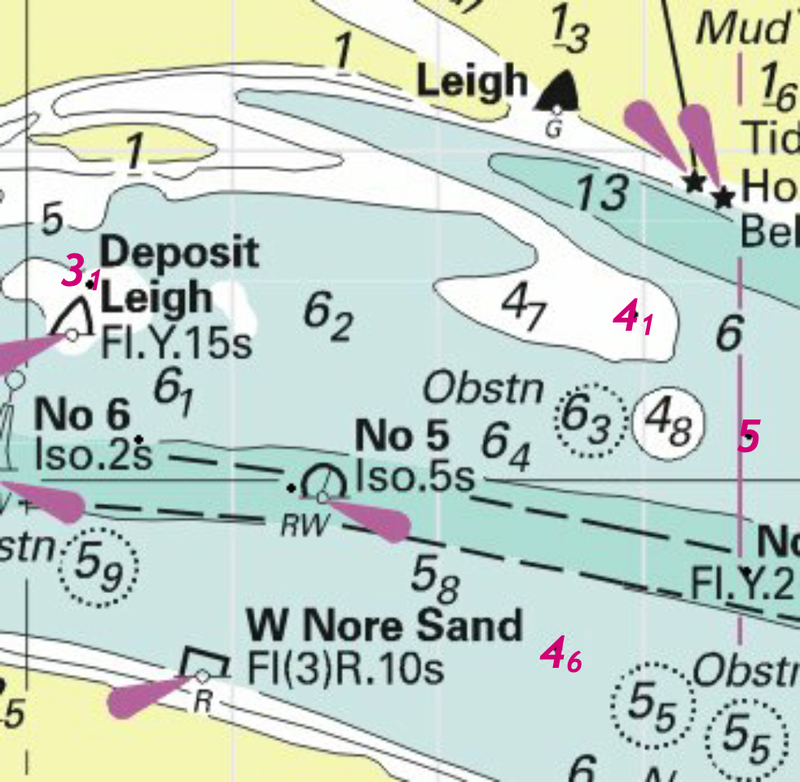 Delete depth, 2.8, close SW.
Two new depths, first in Bugby’s Reach where the depth is increased to 4.9m, the other reduced to 1.1m off Saunders Ness in the Blackwall Reach. depth, 5.1 at 51°29´·75N., 0°01´·75E. Delete depth, 7.4, close SE and depth, 5.7, close E.
depth, 4.5, enclosed by 5m contour at 51°29´·79N., 0°01´·83E. Delete depth, 5.7, close E.
depth, 3.7 at 51°29´·804N., 0°01´·758E. Delete depth, 4.5, close NW. depth, 3.5 at 51°29´·479N., 0°00´·046W. Delete depth, 4.2, close NE. 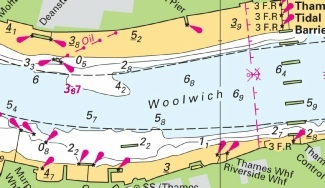 Four reduced soundings west of the Thames Barrier, three reasonably close, the fourth in Blackwall Reach. depth, 13.7 at 51° 29´·40N., 0° 52´·68E. UKHO Charts: 1185 and 1609. One reduction of depth on the edge of the deep water channel just east of the Sea Reach 1 South lateral buoy. Not likely to hinder leisure craft. depth, 8.7 at 51° 27´·131N., 0° 25´·708E. Delete depth, 9, close SW.
UKHO Charts: 1186 and 2484. 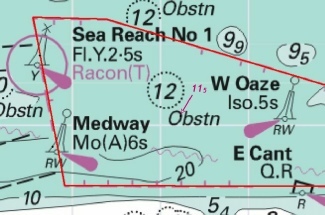 Four reduced depths in the main channel of the Thames off and adjacent to East Tilbury. All are at over 8m so unlikely to hinder leisure craft. depth, 13.1 at 51° 29´·93N., 0° 40´·88E. 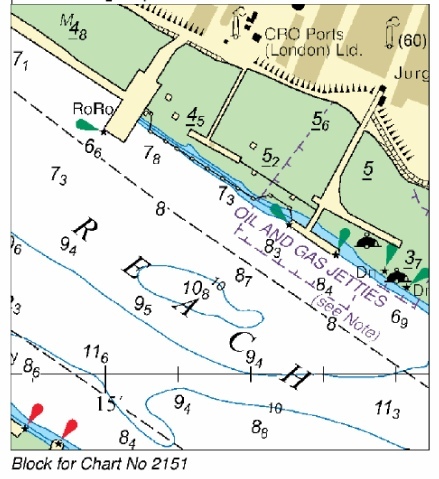 Two reduced soundings in the deep water channel of Sea Reach, either side of the pair of No 5. Both at depths that will NOT be likely to hinder leisure craft. One reduced sounding close to north by Tilburyness. Again at 6m, it is unlikely to hinder leisure craft. Leigh, from: 51° 31´·07N., 0° 42´·57E. to: 51° 31´·09N., 0° 42´·72E. 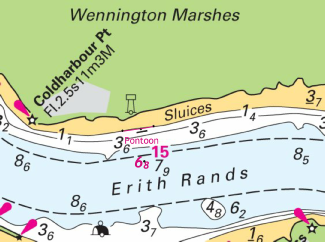 Slight but important move of the Leigh lateral buoy (starboard hand mark for the Thames, port hand mark for Leigh Creek). Insert the accompanying block, centred on: 51° 30´·5N., 0° 33´·5E. Insert the accompanying block, centred on: 51° 30´·4N., 0° 33´·6E. Insert the accompanying block, centred on: 51° 30´·5N., 0° 33´·3E. UKHO Charts: 1185, 1186 and 2484. Three UKHO blocks all dealing with the same location but for different charts. This is the area of the Hole Haven. The PDF blocks may be download opposite. depth, 6.3 at 51° 30´·436N., 0° 33´·202E. depth, 6.8 at 51° 26´·988N., 0° 20´·849E. Delete depth, 7.3 there or depth, 7.4, close W.
depth, 5.3 at 51° 30´·331N., 0° 05´·044E. depth, 5.5 at 51° 30´·786N., 0° 06´·811E. Delete depth, 5.9, close SW.
UKHO Charts: 1185, 1186, 2151 and 2484. ENGLAND - East Coast - Dolphins. Lights. Two new lights on Dolphins on the north bank of the Thames, just before Fiddler’s Reach. depth, 7.8 at 51° 28´·139N., 0° 18´·819E. Delete depth, 8.7, close N.
depth, 8.6, with depth 8.1 at 51° 27´·846N., 0° 15´·849E. Delete depth, 8.4, close SW.
UKHO Charts: 2151 and 2484. 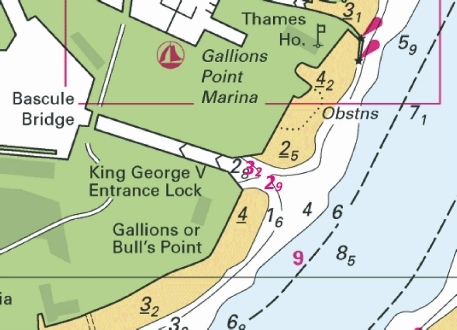 Two reduced depths in the Thames: the first right by the Broadness port hand buoy, the second just east of the QEII bridge. Neither likely to hinder leisure craft. ENGLAND - East Coast - River Thames - Long Reach - NM Block. Jetties. the accompanying block, centred on: 51°28´·1N., 0°15´·2E. 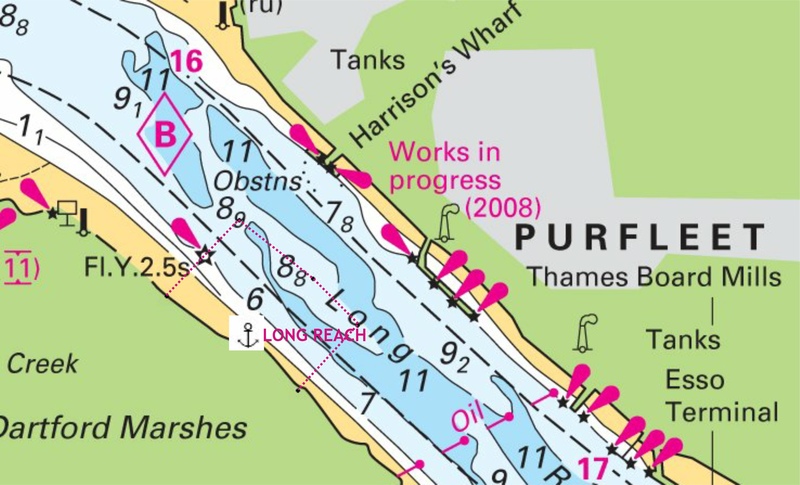 New markings of the Oil and Gas Jetties in the Long Reach (just up-river from the QEII bridge). ENGLAND - East Coast - River Thames - Yantlet Channel - Obstruction. Obstn at 51° 30´·034N., 0° 31´·744E. ENGLAND - South East Coast - Ramsgate - Light. The UKHO are confirming the local Ramsgate NtM reported in week 16 vide local NtM 7 of 2018. The east Pier Head light now deleted. ENGLAND - East Coast - Yantlet Channel - Depths. depth, 10.3 at 51° 30´·23N., 0° 38´·53E. depth, 7.3 at 51° 30´·17N., 0° 40´·02E. Delete depth, 7.8, close SW.
UKHO Leisure Folios: 5606.8, 5606.9. Four reduced depths in the Yantlet Channel. Two affect the Small Craft Crossing points but at a minimum of 10m+ hardly likely to worry leisure craft! ENGLAND - East Coast - River Thames - Yantlet Channel - Depths. depth, 11.8 at 51° 30´·267N., 0° 31´·752E. Delete depth, 12.1, close N.
depth, 13.3 , with depth, 12.9 at 51° 30´·302N., 0° 32´·931E. UKHO Leisure Folios: 5606.8, 5606.13. Three reductions of depth on the northern edge of the deep water Yantlet Channel off Hole Haven Creek. ENGLAND - East Coast - Barking Reach - Depths. depth, 5.1 at 51° 30´·783N., 0° 06´·722E. Delete depth, 5.5.
depth, 5.9 at 51° 30´·778N., 0° 06´·782E. 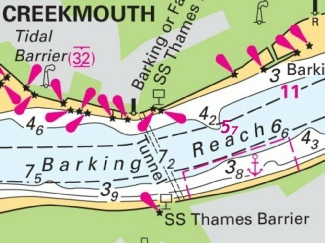 Delete depth, 5.7, close NW and depth, 6.5, close E.
Two reduced soundings in the main channel of the River Thames at the Barking Reach up river from Barking Jetty. ENGLAND - East Coast - River Thames - Jenningtree Point E - Depths. depth, 4.6, and extend 5m contour NE to enclose 51° 30´·212N., 0° 10´·305E. Delete depth, 5.5, close SE. ENGLAND - East Coast - River Thames - Halfway Reach - Buoyage. Deletion of two large moorings. 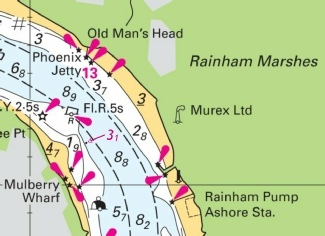 These were either side of Phoenix Jetty – positions marked in the magenta coloured circles. ENGLAND - East Coast - River Thames - Gravesend Reach - Depth. depth, 7 at 51° 26´·878N., 0° 23´·414E. 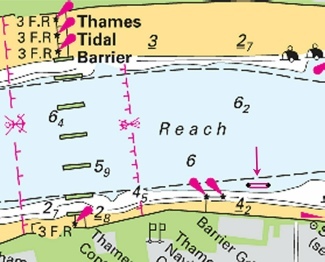 A one reduction of depth in the centre of the main channel of Gravesend Reach of the Thames. ENGLAND - East Coast - River Thames - Ware Point - Wreck. Buoy. (a) at 51° 30´·324N., 0° 05´·140E. The wreck and west cardinal buoy notified vide NtM 5619 of 2017 in Week 48 have now been removed and deleted. ENGLAND - East Coast - Lower Hope Reach - Depth. depth, 8.3, and extend 10m contour SE to enclose 51° 28´·601N., 0° 27´·111E. UKHO Leisure Folios: 5607.2, 5606.3. One new sounding but at over 8 metres unlikely to hinder leisure craft. ENGLAND - East Coast - Sheerness Middle Sand - Drying height. Depth. drying height, 0.2, enclosed by 0m low water line at 51°27´·580N., 0°44´·704E. Delete depth, 0.2, close SW.
New drying height off the Grain Spit opposite Sheerness. A new dangerous wreck with commensurate west cardinal buoy in Gallions Reach. ENGLAND - East Coast - River Thames - Ovens Flat - Depths. 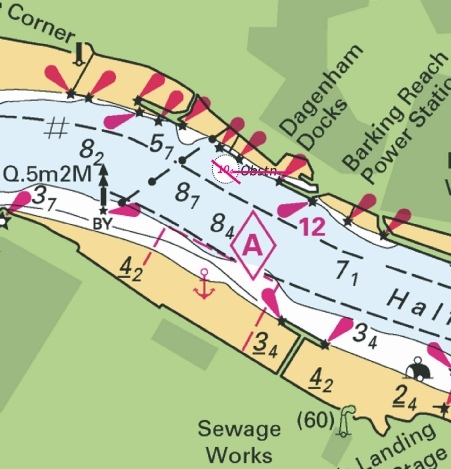 A new reduction of depth on the edge of the Thames channel (but at 8.9m will not hinder leisure craft). ENGLAND - East Coast - Yantlet Channel - Buoy. Q(6)+LFl.15s Oikos at 51° 30´·34N., 0° 33´·62E. Port of London Authority notified this new south cardinal buoy as a temporary mark part of works off the Oikas Jetty No 2 but it appears likely to be long term. Just east of the Hole Haven creek, the works will have to be avoided. ENGLAND - East Coast - Woolwich Reach W - Depths. depth, 4.5, with depth, 4.2 at 51° 29´·743N., 0° 01´·437E. A slight reduction of depth on the south edge of the Thames channel off Greenwich. ENGLAND - East Coast - River Thames - Limehouse Reach - Buoyage. at 51° 29´·495N., 0° 01´·820W. at 51° 29´·464N., 0° 01´·796W. VQ(3)5s at 51° 29´·283N., 0° 01´·633W. 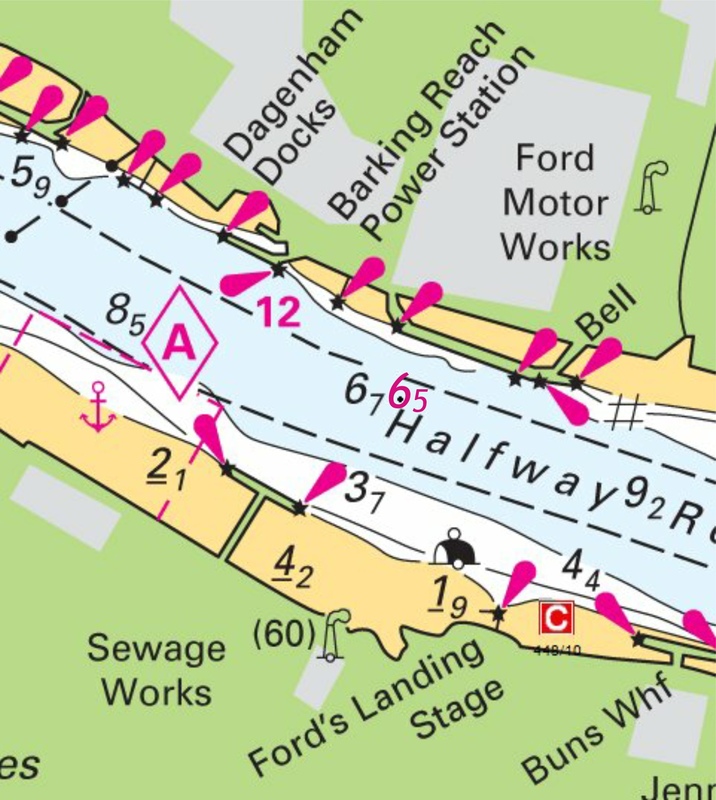 Two new large mooring buoys just from the South Dock Marina entrance and a new east cardinal buoy off Convoy’s Wharf, all in Limehouse Reach. ENGLAND - East Coast - River Thames - Long Reach - Depth. depth, 7.3 at 51° 28´·17N., 0° 14´·94E. A change in depth in the Long Reach off Purfleet. Not for significance for a leisure craft user. ENGLAND - East Coast - River Thames - Gravesend Reach - Landmarks. Note: This update is included in New Edition 1186, published 19 October 2017. Deletion of the two Tilbury Power Station chimneys on the north bank of the Thames. ENGLAND - East Coast - River Thames - Bugsby’s Reach - Depths. depth, 2.6 at 51° 30´·33N., 0° 00´·34E. Delete depth, 4.7, close NE. 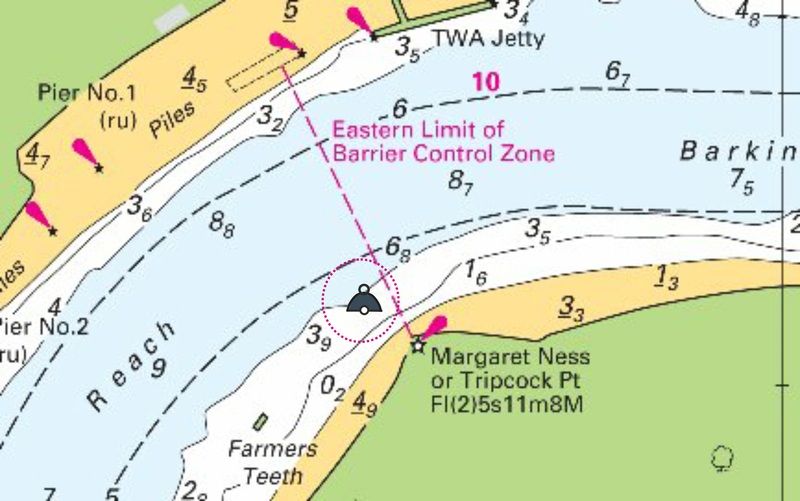 One reduction of depth on the edge of the main channel of the Thames off Blackwall Point. This is a continuing reduction from an earlier reduction. 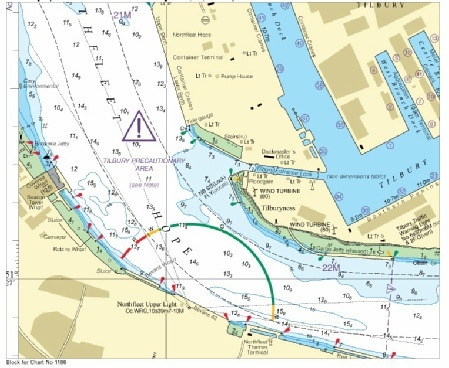 Includes changes to depths from the latest Port of London Authority surveys. ENGLAND - East Coast - Gravesend Reach - Depths. depth, 6.9 at 51°26´·864N., 0°23´·411E. Reduced depth right at the edge of the south side of the main channel in Gravesend Reach. Unlikely to hinder leisure craft. ENGLAND - East Coast - Woolwich Reach E - Light. at 51° 29´·800N., 0° 04´·467E. A new north foreshore light close to the Woolwich Arsenal Pier. ENGLAND - East Coast - River Thames - Jenningtree Point N - Depths. depth, 5.5 at 51°30´·315N., 0°10´·079E. Delete depth, 6, close W.
One small reduction of depth just off the main channel off Jenningtree Point. Not likely to hinder leisure craft. depth, 9.9, and extend 10m contour S to enclose at 51° 30´·20N., 0° 39´·03E. depth, 7.8 at 51° 30´·17N., 0° 39´·99E. Delete depth, 9.1, close SE. 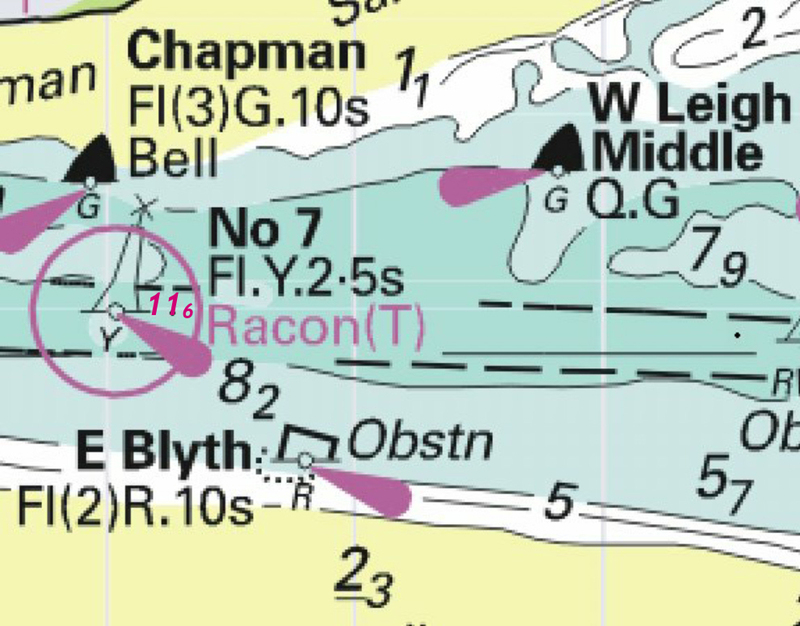 Two reduction of depth just north of the Yantlet Channel adjacent to the Sea Reach No 6. Leisure craft should not be hindered. ENGLAND - East Coast - River Thames - Halfway Reach - Depths. depth, 5.9 at 51° 30´·692N., 0° 08´·984E. Slight reduced depth on the northern edge of the channel off Dagenham. ENGLAND - East Coast - Thames Tidal Barrier - Depth. depth, 5.7 at 51° 29´·787N., 0° 01´·863E. 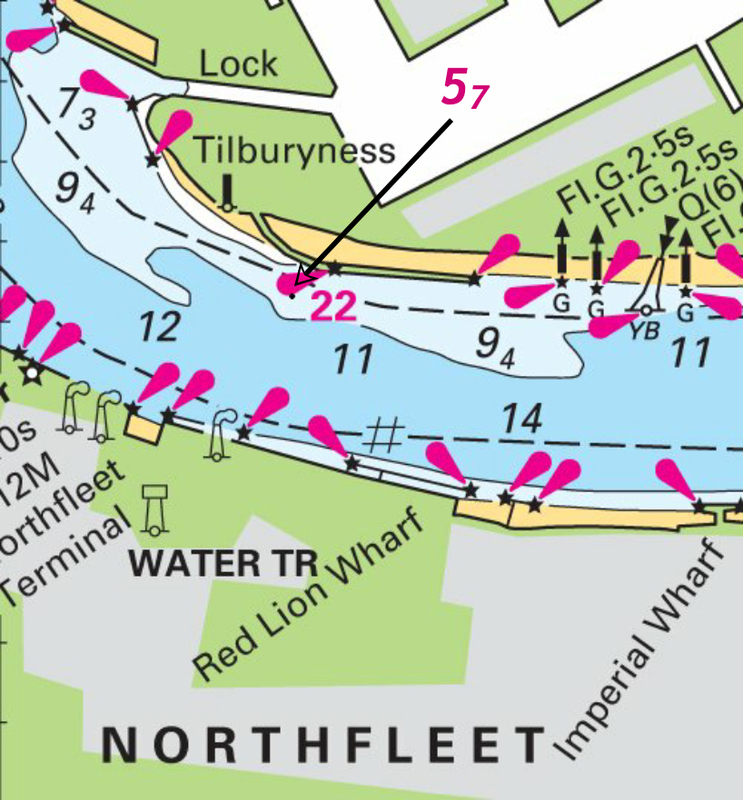 NtoM 531 in Week 5 had added 4 earlier reductions of depth to the west of the Thames Barrier. This NtoM adds a further reduction in the same vicinity, this time more centrally in the channel. (Still not likely to hinder leisure craft). The image now shows all five reductions with this NtoM change highlighted by the magenta circle. ENGLAND - East Coast - River Thames - Barking Reach - Depth. depth, 4.9, and extend 5m contour SE to enclose 51° 30´·816N., 0° 06´·820E. Reduced depth to the east of the approaches to the Thames Barrier. This is a very slight reduction of depth in respect to the first item of NtM 213 of 2017 (Week 3). The reduction is from13.5m to 13.3 so not an issue for leisure craft. ENGLAND - East Coast - Thames Tidal Barrier - Depths. depth, 3.9, enclosed by 5m contour at 51° 29´·823N., 0° 01´·643E. depth, 4, enclosed by 5m contour at 51° 29´·809N., 0° 01´·684E. depth, 4.6, enclosed by 5m contour at 51° 29´·807N., 0° 01´·779E. Imray Leisure Folios: 2000.6, 2000.7.
depth, 13.5 at 51° 30´·28N., 0° 32´·91E. depth, 13.1 at 51° 30´·30N., 0° 33´·22E. Delete depth, 13.6/7, close NE. Imray Leisure Folios: 2100.2, 2100.3. 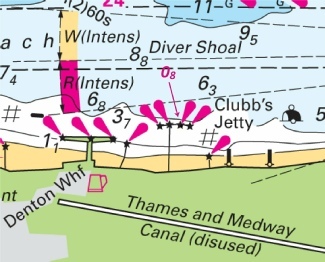 Seven reductions of depth in the River Thames: two off Hole Haven at the northern edge of the shipping channel, one north of Mucking No 1 SHB and 4 on the southern edge of the shipping channel between the West Blyth and Cliffe Fleet PHB. Only north of the Mucking No 1 is likely to hinder leisure craft. ENGLAND - East Coast - River Thames - Gravesend Reach - Fog signal. fog signal, Siren(2)60s, and associated symbol, fog signal 51° 27´·13N., 0° 23´·46E. ENGLAND - East Coast - River Thames - Long Reach - Depths. depth, 6.6 at 51° 28´·196N., 0° 14´·983E. Delete depth, 6.9, close NE. and/or depth, 6.8, close W.
Small reduction of depth close to the Purfleet Ro-Ro berth. ENGLAND - East Coast - Thames Tidal Barrier W - Depths. depth, 4.5, and extend 5m contour NE to enclose 51°29´·744N., 0°01´·438E. Delete depth, 4.6, close SW.
Two reduced depths to the west of the Thames barrier. ENGLAND - East Coast - River Thames - Blackwall Reach S - Depths. depth, 1.5 at 51°29´·47N., 0°00´·09W. Delete depth, 1.9, close NE. 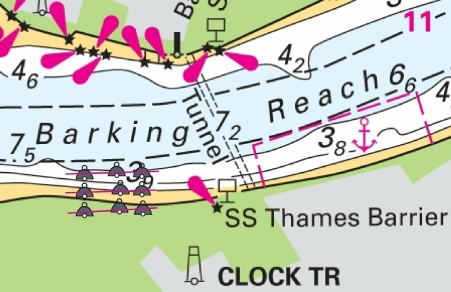 Two reduction of depth on the west bank of the Thames in Blackwall Reach. ENGLAND - East Coast - River Thames - Shellhaven S - Buoyage. Fl.Y.2·5s PLA No 22, with R PLA No 22 at 51° 30´·309N., 0° 30´·928E. Fl.Y.2·5s PLA No12, with R PLA No 12 at 51° 30´·321N., 0° 31´·031E. Fl.Y.2·5s PLA No 11, with R PLA No 11 at 51° 30´·331N., 0° 31´·138E. The three PLA ship moorings are no longer lit. ENGLAND - East Coast - River Thames - Gravesend Reach NE - Depths. depth, 1.7, and extend 2m contour S to enclose 51° 27´·317N., 0° 25´·847E. Delete depth, 2.6, close S.
depth, 1.6, and extend 2m contour S to enclose 51° 27´·244N., 0° 25´·512E. Two reduction of depths on the edge of the north bank of the Thames off Coalhouse Point. Includes changes to depths over the Goodwin Sands from the latest British Government Surveys. ENGLAND - East Coast - River Thames - Yantlet Channel - Depth. Note: This update is included in New Edition 1186, published 7th July 2016. 13.6 at 51° 30´·16N., 0° 32´·21E. Increase of the depth in the maintained channel of the Yantlet. Not an issue for leisure craft. ENGLAND - East Coast - River Thames - Blackwall Reach and Wapping - Foul. Buoy. 2. Removal of ship’s mooring off the south bank of the Thames off Bermondsey. Insert depth, 2.6, and extend 5m contour SW to enclose 51°28´·046N., 0°15´·462E. Delete depth, 6.5, close W.
A reduction of depth close to the Van de Bergh commercial jetty just west of the QE II bridge. Unlikely a leisure craft will be close to this jetty! 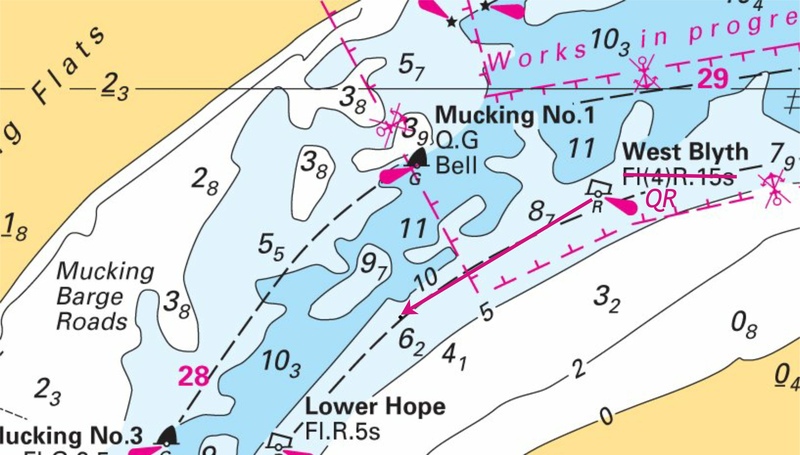 ENGLAND - East Coast - River Thames - Mucking Flats SE - Depth. depth, 9 at 51° 29´·526N., 0° 28´·178E. Delete depth, 9.6 , close N.
Reduction of sounding in the centre of the deep water channel between the Mucking No 1 and No 3. ENGLAND - East Coast - River Thames - Canvey Island S - Depths. depth, 11.6 at 51°30´·338N., 0°34´·330E. Delete depth, 13.7, close NW. 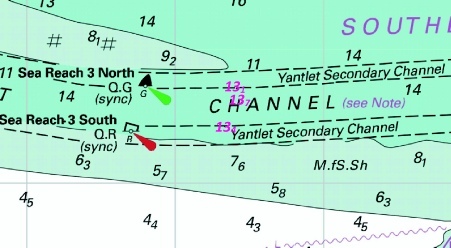 A small reduction of depth outside of the Yantlet Channel west of Scar’s Elbow starboard hand buoy. Unlikely to hinder leisure craft. ENGLAND - East Coast - River Thames - Coalhouse Point SE - Depths. depth, 8 at 51° 27´·364N., 0° 26´·193E. 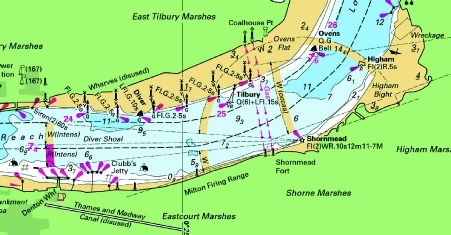 Delete depth, 8.8, close W.
Small reduction at the edge of the shipping channel between the Ovens and Tilbury channel buoyage. Unlikely to hinder leisure craft. ENGLAND - East Coast - River Thames - Hole Haven - Depths. depth, 3.4 , with depth, 2.2 at 51° 30´·46N., 0° 32´·58E. depth, 14.5 , with depth, 13.7 at 51° 30´·42N., 0° 32´·84E. 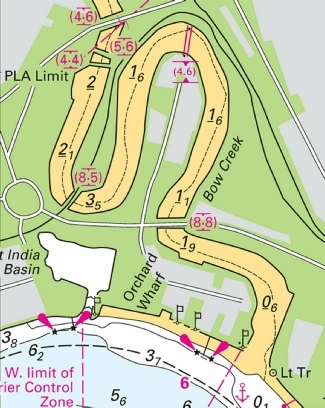 New reduce of sounding in the Hole Haven Creek which yachts may use. Two other reduced soundings are outside the Jetty. ENGLAND - East Coast - River Thames - Kings Reach E - Buoyage. 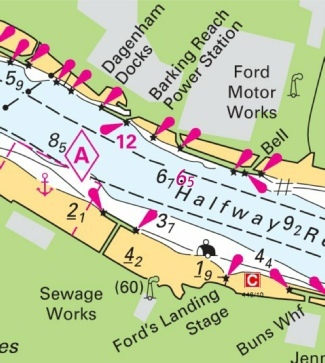 Removal of 9 large mooring buoys opposite Barking Creek. ENGLAND - East Coast - River Thames - Thames Haven S - Depths. Single reduced depth near to the West Blyth port hand buoy. Unlikely to hinder leisure craft. depth, 7.5 at 51° 28´·220N., 0° 14´·893E. Delete depth, 8, close W.
Image courtesy of Imray Chart C2 and Meridian ID10. A reduction in depth that should not affect leisure craft off the Esso Terminals on the north bank of the Thames. ENGLAND - East Coast - River Thames - Erith Sands E - Depth. depth, 4.1, and extend 5m contour N to enclose 51° 29´·009N., 0° 13´·078E. Delete depth, 4.5, close SE. A small reduction in depth on the edge of the main channel of the River Thames at Erith Rands. ENGLAND - East Coast - River Thames - Gravesend Reach W - Depths. depth, 7.3 at 51° 26´·988N., 0° 20´·846E. Delete depth, 7.6, close N or depth, 8.8, close W depending upon chart. New reduced depth off the Tilbury shore in Gravesend Reach. Depth should not trouble leisure craft. ENGLAND - East Coast - River Thames - The Warp SW - Depths. depth, 13.3 at 51°29´·34N., 0°52´·89E. Delete depth, 13.9 , close E.
depth, 13.9 at 51°29´·07N., 0°54´·85E. Image courtesy of Imray C1 and Meridian ID10. 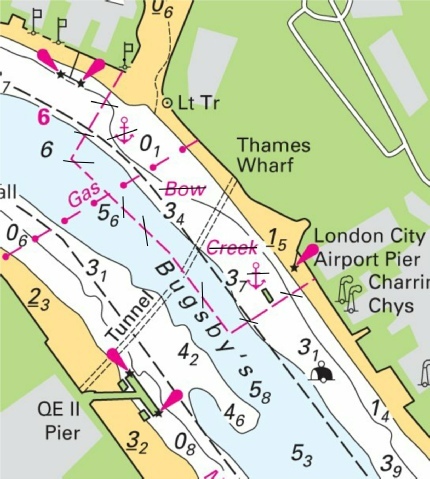 Two reduced depths (but of sufficient depth not to hinder leisure craft) on the edge of the channel leading to the Yantlet Channel, River Thames. ENGLAND - East Coast - River Thames - Thames Haven - Depths. depth, 3.3, and extend 5m contour SE to enclose 51°30´·055N., 0°28´·362E. Delete depth, 7.5, close E.
depth, 8.6, and extend 10m contour S to enclose 51°30´·288N., 0°30´·346E. Delete depth, 12.7, close NE. Image courtesy of Imray C2 and Meridian ID10. 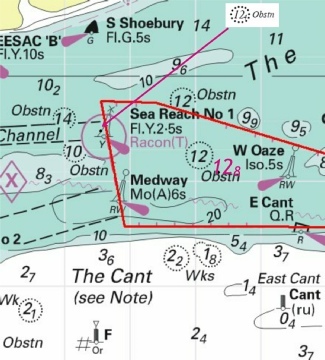 Reductions in depths off Thames Haven from where leisure craft should keep clear. depth, 13.7 at 51° 30´·14N., 0° 36´·81E. Delete depth, 14.5, close W.
A small reduction in depth which is unlikely to trouble leisure craft to the west of the Sea Reach No 7 buoy. ENGLAND - East Coast - River Thames - Thames Tidal Barrier W - Depths. 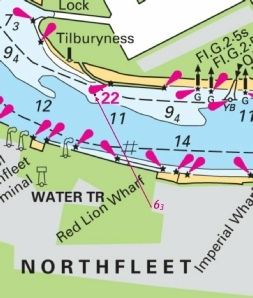 Two new reductions in depth to the west of the Thames Barrier. ENGLAND - East Coast - River Thames - Creekmouth - Light-beacon. Q(6)+LFl.15s at 51° 30´·827N., 0° 05´·700E. 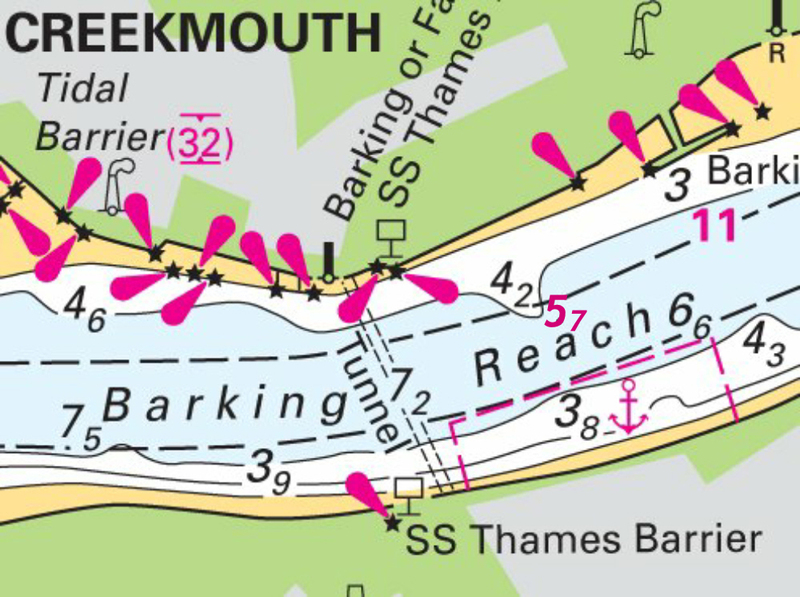 Reduction of depth in Barking Reach but sufficient depth remains for leisure craft. ENGLAND - East Coast - River Thames - Saint Clement’s or Fiddler’s Reach - Depths. depth, 3.2, at 51° 27´·618N., 0° 17´·036E. Delete depth, 3.7, close N.
depth, 5.2, at 51° 27´·531N., 0° 16´·681E. Delete depth, 5.9, close W.
depth, 4.8, and extend 5m contour N to enclose 51° 28´·05N., 0° 18´·32E. Image courtesy of Imray charts and Meridian ID10. UKHO Admiralty Charts: 2151 and 2484. 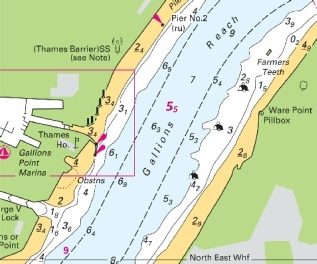 Three reductions of depth in the Thames off Greenhithe. 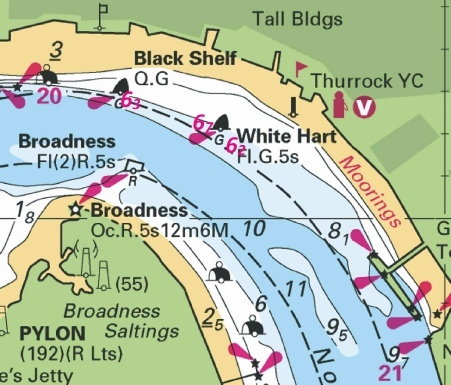 ENGLAND - East Coast - River Thames - Northfleet Hope NW - Broadness - Depths. Replace depth, 8.5, with depth, 8 at 51° 28´·146N., 0° 18´·822E. 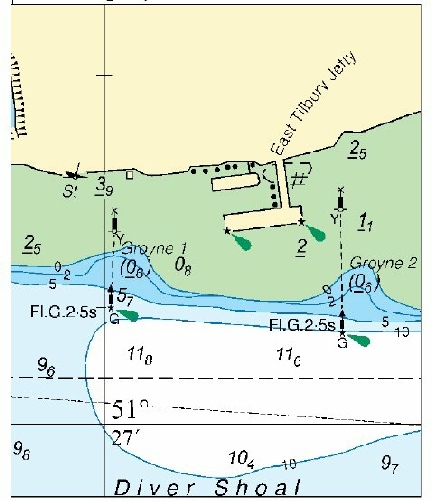 Reduction of depth by half a metre, close north of the Broadness port hand buoy, River Thames off Grays. Gravesend Reach SE - Depths. Drying height. depth, 0.8, enclosed by 2m contour at 51° 26´·710N., 0° 24´·127E. depth, 4.5, with depth, 3.7 at 51° 30´·453N., 0° 32´·484E. 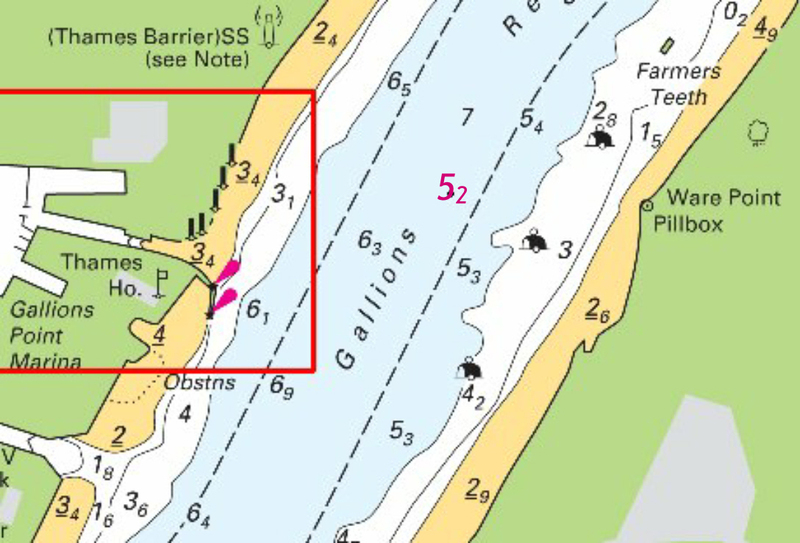 depth, 0.3, with drying height, 0.5, and extend 0m low water line SE to enclose 51° 30´·005N., 0° 27´·973E. UKHO Admiralty Charts: 1186 and 2484. 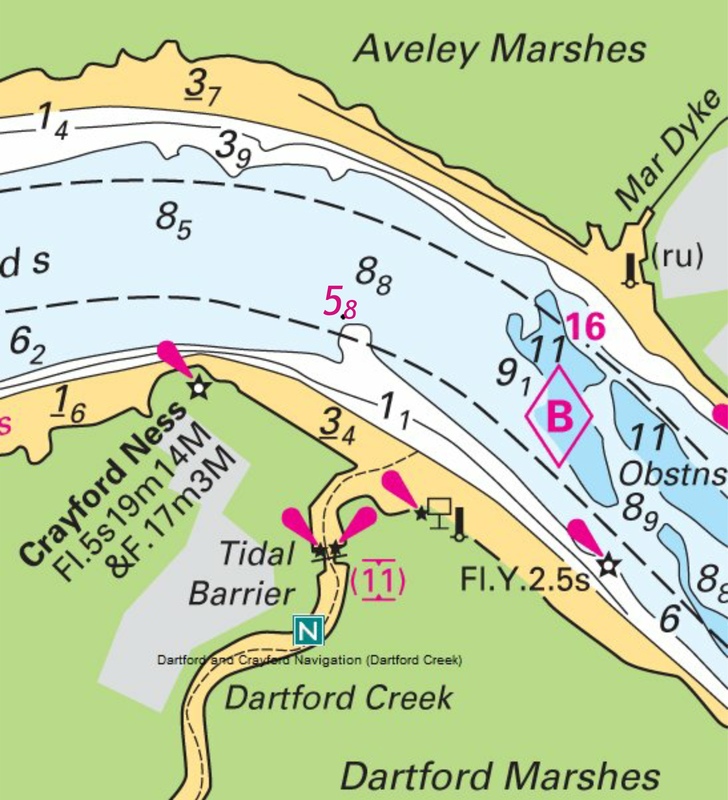 Five reductions in depths are varied locations in the Thames: two at Coryton close to the commercial wharf which will not trouble leisure craft, one, a new drying height, on the edge of Mucking Flats which is worth noting, one at the western side of the small craft crossing (although still 6 metres, this is actually a reduction of 2.6m! ), and one by Clubb’s Jetty. ENGLAND - East Coast - River Thames - Gallions Reach - Depths. depth, 5.5 at 51° 30´·343N., 0° 04´·986E. A reduction in depth (which will not trouble leisure craft but right in the middle of the central channel in Gallions Reach, River Thames. ENGLAND - East Coast - River Thames - Thames Tidal Barrier E - Pontoon. pontoon, double firm line, width 5m, joining: 51°29´·749N., 0°02´·595E. and 51°29´·749N., 0°02´·639E. A new pontoon installed on the eastern side of the Thames Barrier on the northern foreshore. ENGLAND - East Coast - River Thames - Northfleet Hope to Gravesend Reach - Precautionary area. Legend. Note. symbol, precautionary area, centred on: 51°27´·399N., 0°19´·881E. 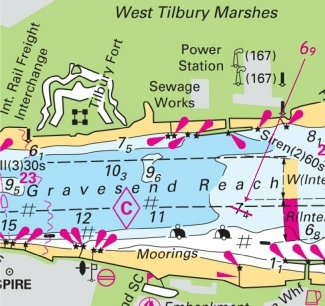 TILBURY PRECAUTIONARY AREA (see Note), centred on: 51°27´·312N., 0°19´·883E. UKHO Admiralty Charts: 1186, 2151 and 2484. 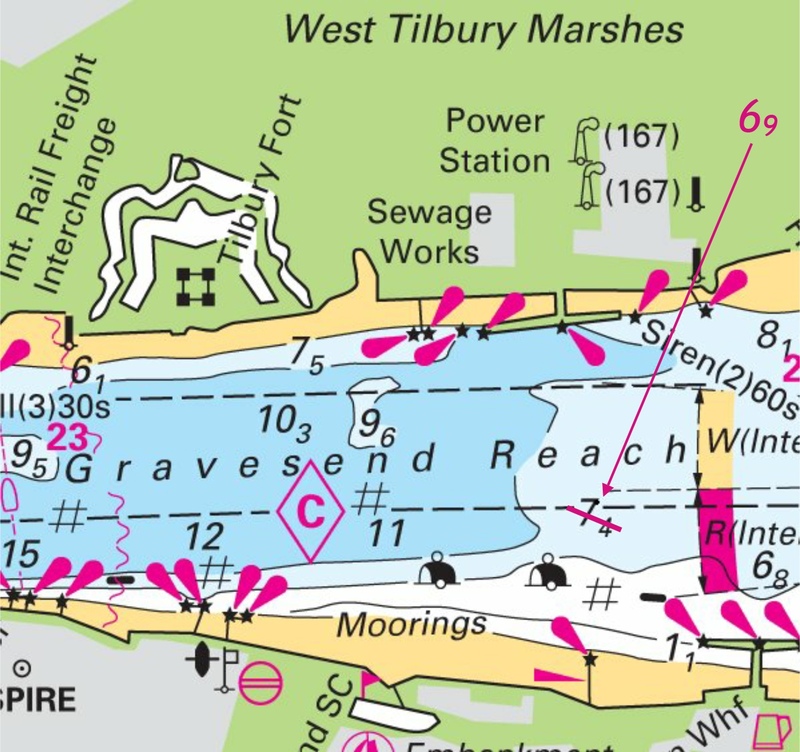 New Precautionary Area in the Thames at Tilbury. ENGLAND - East Coast - River Thames - Bugsby’s Reach N - Bow Creek - Bridge. - Vertical clearance. A new bridge over Bow Creek off Bugsby’s Reach, River Thames. ENGLAND - East Coast - River Thames - Northfleet Hope South-eastwards - Depths. depth, 58 (a) at 51° 27´·043N., 0° 20´·576E. depth, 76 (b) at 51° 27´·000N., 0° 20´·853E. 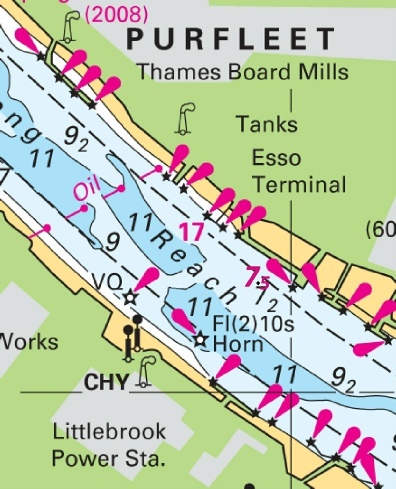 UKHO Admiralty Charts: 1186 and 2151. Two new depths on the north side of Gravesend Reach, River Thames. These depths should not trouble leisure craft. Q.G (sync) Sea Reach 3 North at 51°29´·41N., 0°46´·80E. light-buoy to, Q.R (sync) at 51°29´·22N., 0°46´·71E. 51°29´·42N., 0°40´·86E. to: 51°29´·48N., 0°40´·87E. 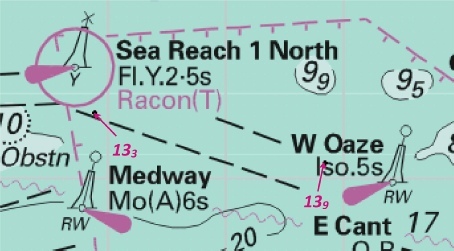 Q(6)+LFl.15s South East Leigh at 51°29´·41N., 0°47´·06E. UKHO Leisure Folios: 5606.7 and 5606.8. UKHO confirmation of changes in the Yantlet Channel and environs announced by PLA NtM L16 in week 38. ENGLAND - East Coast - River Thames – Bugsby’s Reach - Bow Creek - Anchorage area. Note. 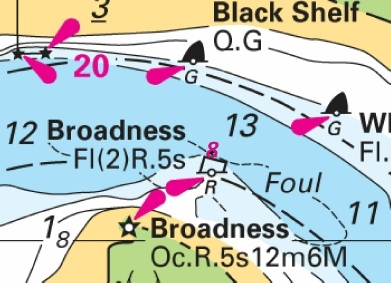 reference, Bow Creek at 51°30’·31 0°00’·61 2 Hours, within the DESIGNATED ANCHORAGE AREAS table, centred on: 51° 27´·00N., 0° 28´·90E. 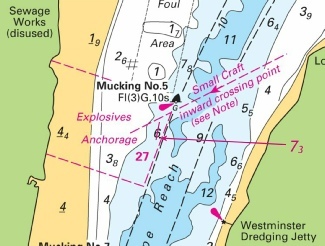 Deletion of the designated anchorage at Bow Creek, in Bugsby’s Reach, River Thames. ENGLAND - East Coast - River Thames - Erith Rands - Depths. Pontoon. pontoon, single firm line, joining: 51° 29´·249N., 0° 11´·816E. and (c) 51° 29´·251N., 0° 11´·838E. depth, 68 at (d) 51° 29´·151N., 0° 11´·843E. New depths and a new pontoon at the Erith Rands. The change in the low water line is barely noticeable at the usual chart scale. ENGLAND - East Coast - River Thames - Yantlet Channel, Lower Hope Reach - Depths. depth, 25 at (a) 51° 30´·49N., 0° 32´·28E. depth, 52 at (b) 51° 30´·483N., 0° 33´·439E. depth, 64 at (c) 51° 30´·479N., 0° 33´·381E. depth, 73 at (d) 51° 28´·603N., 0° 27´·085E. 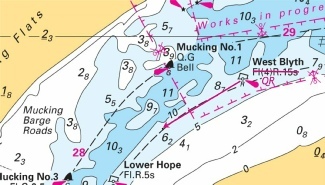 Replace depth, 146 , with depth, at 135 at 51° 30´·311N., 0° 30´·669E. UKHO Admiralty Charts: 1185, 1186 and 2484. A range of new depths in the River Thames near Hole Haven, Coryton and Hope Reach. 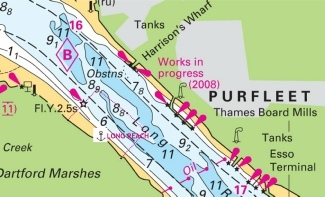 Those near the wharfs on the north side of the River are in areas that leisure craft should not be using. The new depth in Hope Reach is an increase and will not affect leisure craft. ENGLAND - East Coast - Sea Reach - Yantlet Channel - Obstruction. Delete Obstn at 51°29´·47N., 0°52´·56E. Image courtesy of Imray Charts and Meridien ID10. UKHO Admiralty Charts: 1185, 1607 and 1609. Slightly mystified by this one as it repeats part of Notice 1063 of week 10 of this year. Obstruction at 12.4m by Sea Reach No 1. Not likely to hinder leisure craft. This is a repeat of the week 10 image. Note the magenta ’12.8’ sounding is an additional part of that earlier notice. 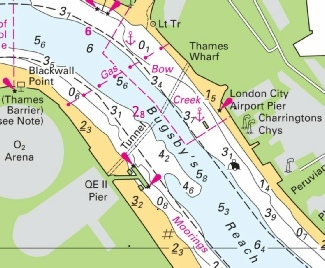 ENGLAND - East Coast - River Thames - Thames Haven S - Buoyage. New block, showing amendments to buoyage, centred on: 51° 29´·765N., 0° 28´·521E. This is confirmation of the permanent siting of the West Blyth PHB and Mucking No 1 SHB following the completion of the works at the London Gateway. sheets have been fully updated for New Editions and Notice to Mariners affecting source charts. 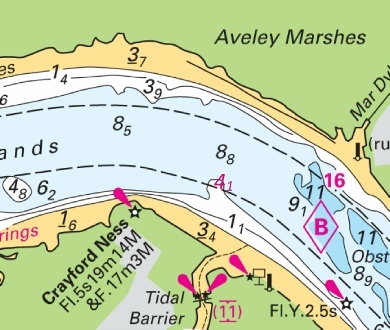 Notice 1062 - ENGLAND - East Coast - River Thames - Crayford Ness NE and Halfway Reach - Depths. Insert depth, 58 at 51° 29´·034N., 0° 13´·026E. Delete depth, 65 at 51° 29´·046N., 0° 12´·959E. Insert depth, 65 at (a) 51° 30´·669N., 0° 08´·992E. depth 58 at (a) 51° 29´·03N., 0° 13´·03E. depth 65 at 51° 30´·67N., 0° 08´·99E. UKHO Admiralty Charts: 2151 and 2484 including panels. 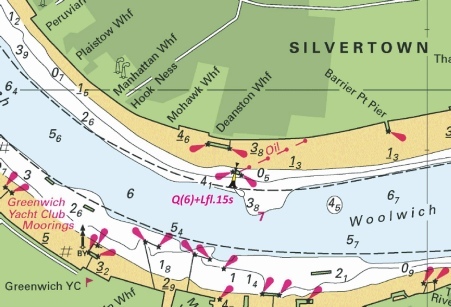 Two small reductions in depth on the Thames: the first at Purfleet just above Dartford Creek, the second in Halfway Reach opposite the Ford Motor Works. Neither reduction is likely to trouble leisure craft. Image courtesy of Imray Charts and Meridien ID10. Left click to enlarge, right click to download. Notice 1063 - ENGLAND - East Coast - London Gateway to Oaze Precautionary Area - Yantlet Channel - Depths. - Obstruction. Dredged area. at 51° 29´·47N., 0° 52´·56E. depth, 128 at (a) 51° 29´·08N., 0° 54´·35E. Amend dredged depth to, 14·0m (2014), centred on: 51° 30´·15N., 0° 35´·50E. and 51° 29´·35N., 0° 48´·65E. depth, 118 at 51° 30´·09N., 0° 37´·02E. depth, 117 at 51° 30´·10N., 0° 37´·25E. Amend dredged depth to, 14·0m (2014), centred on: 51° 30´·15N., 0° 31´·7E. and 51° 30´·15N., 0° 35´·3E. depth, 127 at (a) 51° 29´·04N., 0° 54´·51E. Amend dredged depth to, 14m (2014), centred on: 51° 29´·25N., 0° 53´·60E. Amend dredged depth to, 14·0m (2014), centred on: 51° 30´·2N., 0° 32´·2E. 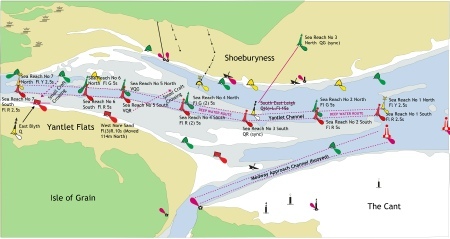 Further depth changes as a result of the recent dredging programme for the London Gateway. First an obstruction right by the Sea Reach No 1 buoy and a new depth due west of the W. Oaze safe water buoy. At over 12m, neither will trouble leisure craft. The alteration to the dredged depth is for the centre of the Yantlet Channel. 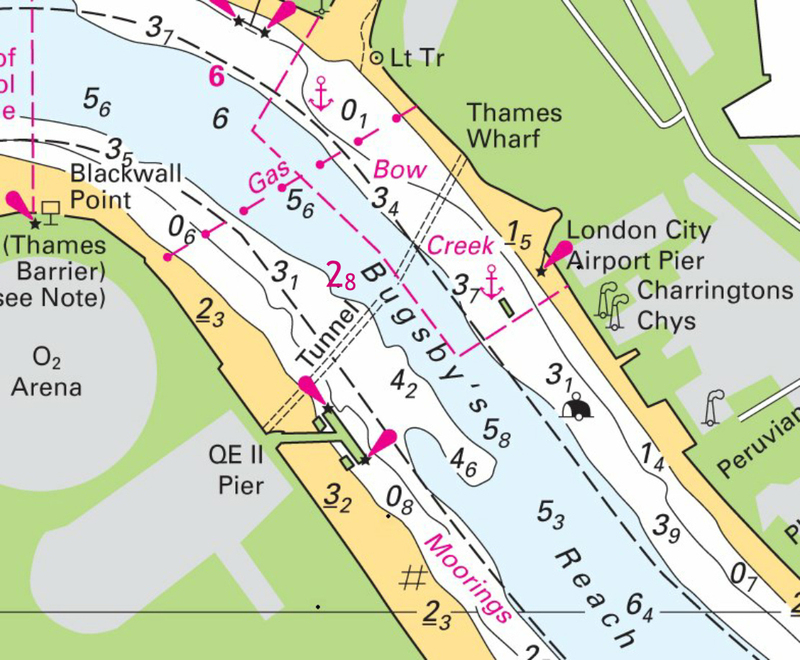 Notice 479 - ENGLAND - East Coast - River Thames - Thames Haven S - Buoy. 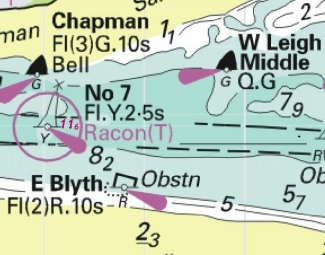 Insert Q.R West Blyth at 51° 29´·570N., 0° 28´·387E. Delete former West Blyth light-buoy at 51° 29´·733N., 0° 28´·800E. 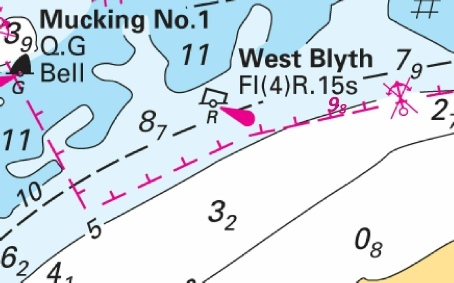 Move Q.R West Blyth, from: 51° 29´·73N., 0° 28´·80E. to: 51° 29´·57N., 0° 28´·39E. The nomadic West Blyth PHB is now repositioned further to the south west. Readers will recall that the light characteristics were altered to QR vide NtM 5225 of 2013 (week 50). 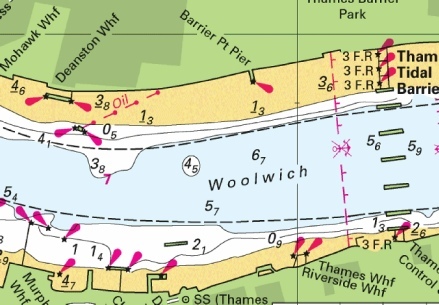 Notice 214 - ENGLAND - East Coast - River Thames - Bugsby.s Reach and Woolwich Reach - Depths. Insert depth, 53 at 51° 29´·797N., 0° 01´·728E. Insert depth 53 (a) 51° 29´·80N., 0° 01´·73E. depth, 45 , and extend 5m contour NE to enclose 51° 30´·168N., 0° 00´·661E. depth, 35 (a) at 51° 29´·835N., 0° 01´·606E. depth, 53 at 51° 29´·797N., 0° 01´·728E. 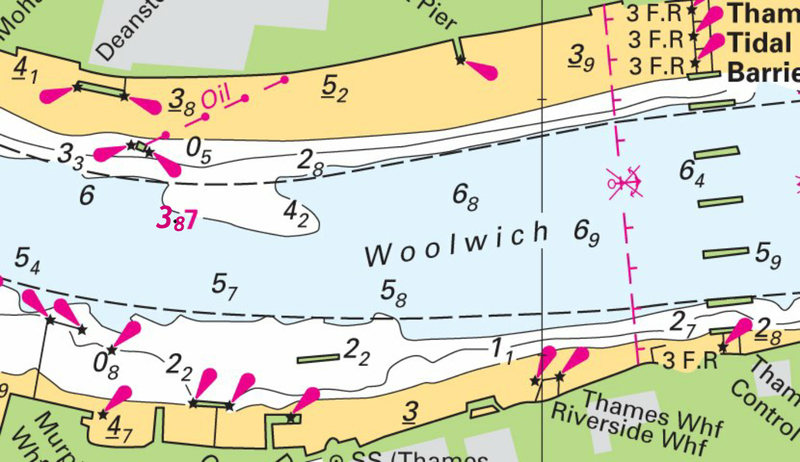 Three new depths in Bugsby and Woolwich Reachs, River Thames. 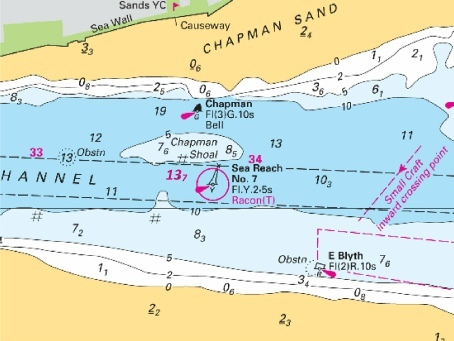 The implication of the sounding in Bugsby’s Reach is that large craft may well be seeking to the eastern side of the channel at this point to avoid the enlarging shallows. 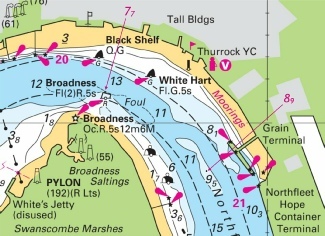 Notice 5225 - ENGLAND - East Coast - River Thames - Long Reach, Broadness Northwards, Northfleet Hope, Gravesend Reach and Thames Haven Southwards - Buoy. Depths. 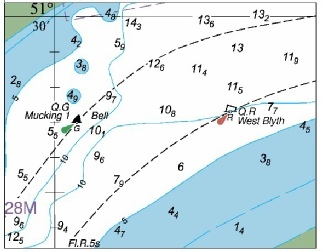 Q.R West Blyth at 51° 29´·733N., 0° 28´·800E. depth 89 at 51° 27´·783N., 0° 19´·564E. depth 69 at (a) 51° 26´·877N., 0° 23´·373E. depth 68 at (a) 51° 28´·205N., 0° 14´·938E. Replace depth 85 with depth 77 at 51° 28´·139N., 0° 18´·820E. depth 68 at (a) 51° 28´·21N., 0° 14´·94E. depth 77 at 51° 28´·14N., 0° 18´·82E. depth 89 at 51° 27´·78N., 0° 19´·56E. depth 69 at (b) 51° 26´·88N., 0° 23´·37E. Replace BdFl(4)R.15s West Blyth with BdQ.R West Blyth at 51° 29´·73N., 0° 28´·80E. Insert depth 68 at (a) 51° 28´·21N., 0° 14´·94E. UKHO Leisure Folios: 5606.13, 5606.14. Images courtesy of Imray Charts and Meridien ID10. Left click to enlarge, right click to download. Notice 4918 - ENGLAND - East Coast - River Thames - Yantlet Channel Westwards and Long Reach - Anchorage area. - Legends. Harbour limit. Berths. Buoyage. Coastline. Depths. Works. Legends. - Cautionary note. 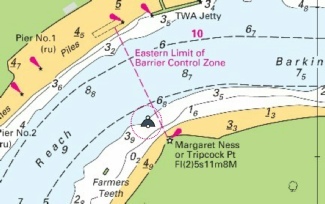 the accompanying block, showing new harbour limit, berths and amendments to buoyage, coastline, depths, works, legends and cautionary note, centred on: 51° 29´·70N., 0° 29´·35E. 2. legend, YANTLET SECONDARY CHANNEL, centred on: 51° 30´·33N., 0° 33´·23E. and 51° 30´·08N., 0° 33´·23E. UKHO Leisure Folios: 5606.8, 5606.13, 5606.14. 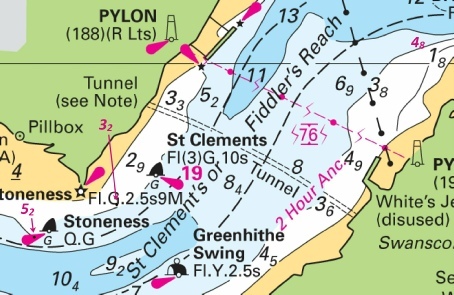 This notice comprises three amendments: first a revised anchorage in Long Reach opposite Purfleet, second a replacement block for the western end of the Yantlet Channel and thirdly the insertion of the legend ‘Yantlet Secondary Channel’ south of Holehaven Point. Image courtesy of Imray Charts and Meridian ID10. Left click to enlarge; right click to download. Image is copyright of the UKHO. Click on image to download as a JPEG image or here to download as the original UKHO PDF file. 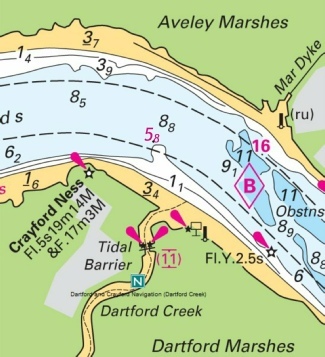 Chart 1186 - England – East Coast, River Thames, Canvey Island to Tilbury. 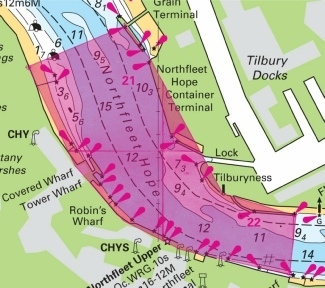 Includes changes to Yantlet Channel, buoyage, anchorages and depths from the latest Port of London Authority surveys. Includes details of the new London Gateway Container Port and changes from the latest Port of London Authority surveys. 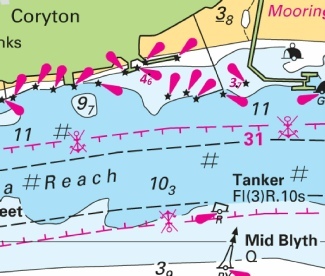 Includes significant changes to buoyage and deep water route in the Thames Estuary. 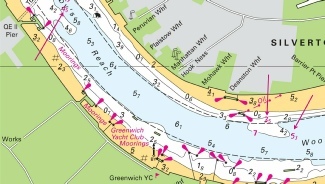 Notice 4558(T)/13 ENGLAND - East Coast - River Thames - Gravesend Reach, Lower Hope Reach, Mucking Flats, Sea Reach, Maplin Sands and Oaze - Measuring instruments. Buoyage. The monitoring equipment and associated buoyage will remain in position until early 2014. Frequent survey operations will take place in this region for the duration of the deployment. Mariners are advised to navigate with caution in the above areas. Former Notice 3218(T)/12 is cancelled. UKHO Charts: 1185, 1186, 1607, 1609, 2151, 2484, 3683 and 3750. UKHO Leisure Folios: 5606.2, 5606.5 to 9. 5606.13 & 14. 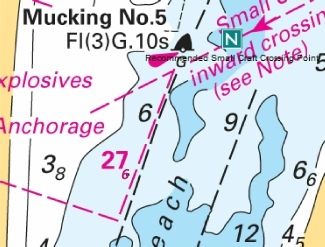 This is a large area in which lit and unlit monitoring equipment buoys may be encountered. Note: This chart remains affected by Notice 3218(T)/12. 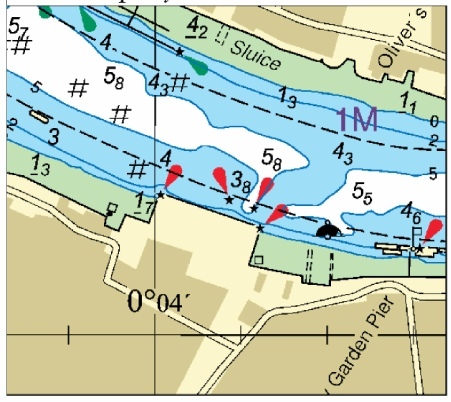 Includes changes to depths from the latest Medway Port Authority Surveys. Notice 3514(P)/13 ENGLAND - East Coast - River Thames - Yantlet Channel - Buoyage. During August 2013 a new gated buoy layout will be placed in Yantlet Channel between Sea Reach No1 buoy (51°29´·5N., 0°52´·7E.) and Sea Reach No 7 buoy (51°30´·1N., 0°36´·4E.) (ETRS89 Datum). The centre line buoys will be removed. 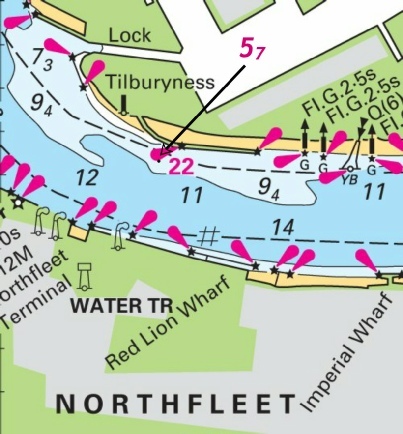 Mariners are advised to refer to the Port of London Authority and London VTS for the latest information. 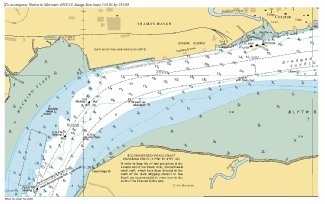 Charts will be updated when the buoy changes are complete. During August 2013 a new gated buoy layout will be put in place in 2 phases for the dredged and deepened Yantlet channel by Marine Services Vessel HOOKNESS. Gated buoys will be placed along the dredged channel edge in line with the pre-dredge positions of Sea Reach 1 – 7 buoys. The centre line buoys will be removed. 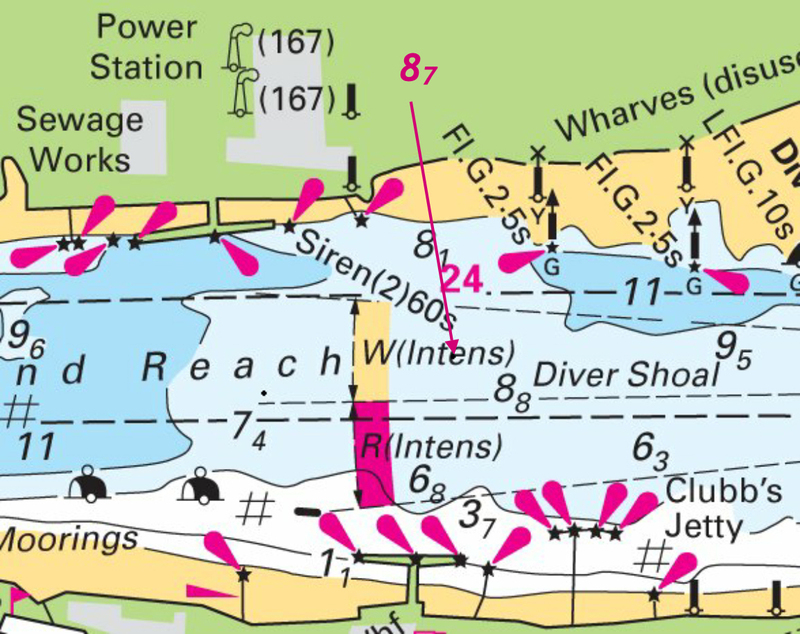 On or about 12th August 2013, Sea Reach centre line buoys 1, 3, 5 and 7 will be removed and the following gated buoys substituted. Work is expected to take 4 days to complete. 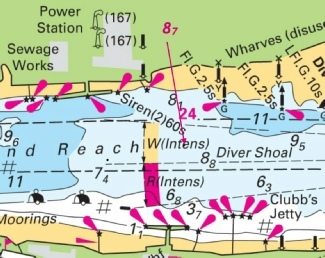 On or about 27th August 2013, Sea Reach centre line buoys 2, 4 and 6 will be removed and the following gated buoys substituted. Work is expected to take 4 days to complete. UKHO Charts: 1183, 1185, 1186, 1607 and 1609. Imray charts: C1 and C2. PLA Notice 14 is reproduced below. 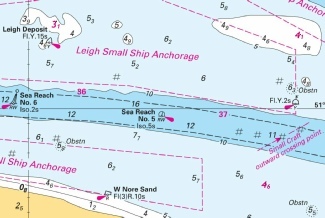 The changes are relatively straight forward and there appears to be no change to the Small Craft crossing point. Notice 3326 - ENGLAND - East Coast - River Thames - Gallions Reach and Erith Reach North-westwards - Depths. 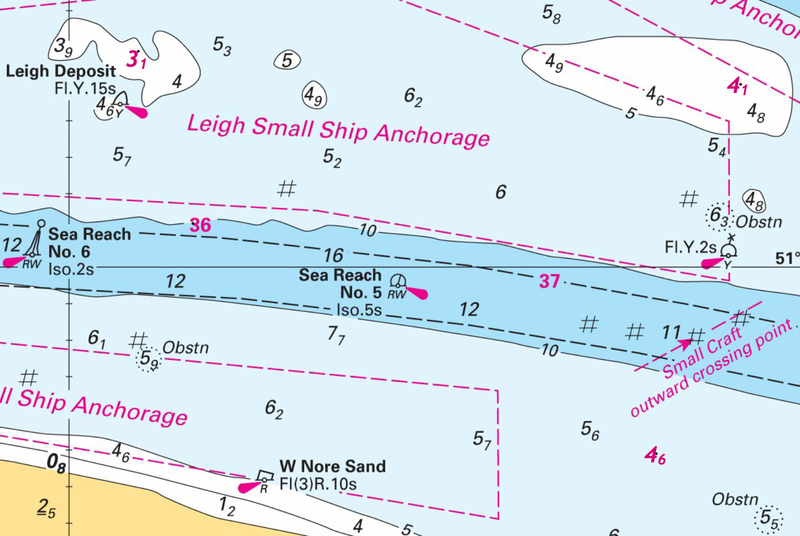 Note: This update has been included in a New Edition of Chart 2484 published 25 July 2013.
depth 31 and extend 5m contour E to enclose 51° 30´·151N., 0° 10´·323E. depth 52 at (a) 51° 30´·341N., 0° 05´·021E. Insert depth 52 at (a) 51° 30´·341N., 0° 05´·021E. 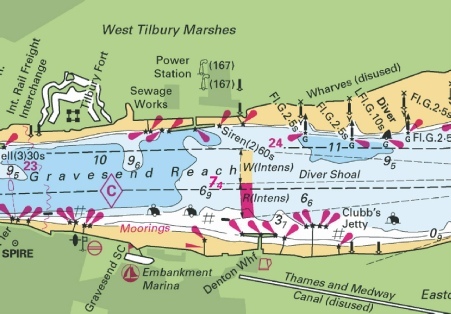 Reductions in depth at two places in the Thames in the main channel. Images courtesy of Imray charts and Meridian ID10. Left click to enlarge; right click to enlarge. 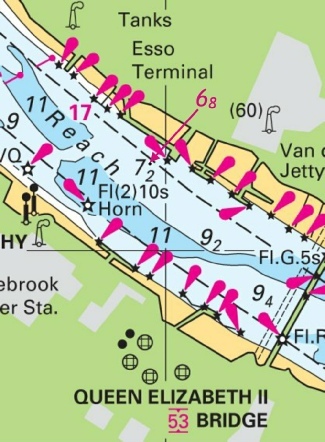 Notice 3155 - ENGLAND - East Coast - River Thames - Gravesend Reach - Tilburyness Southwards - Depths. Note: This update will be included in a New Edition of Chart 2484 to be published 25 July 2013. Insert depth 57 (a) 51° 27´·029N., 0° 20´·584E. UKHO Charts: 1186, 2151 and 2484. 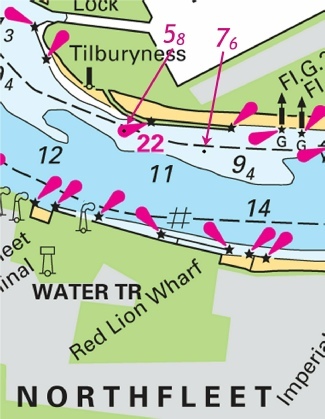 This reduction in depth is a further reduction on that published in notice 2314 of 2013 (see week 21) in the Thames off Tilburyness but should still not trouble leisure craft. 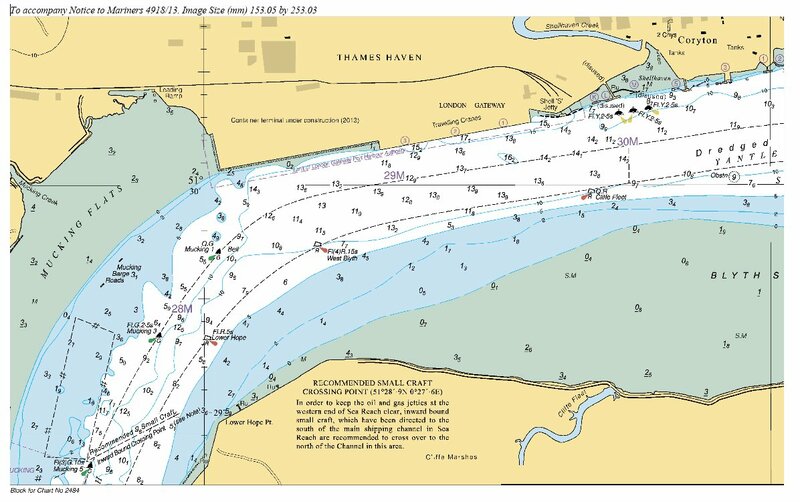 Chart 2484 - International Chart Series, England – East Coast, River Thames, Hole Haven to London Bridge. Authority surveys and changes to coastline. Notice 2314 - ENGLAND - East Coast - River Thames - Gravesend Reach - Tilburyness South-eastwards - Depths. Insert depth 63 at (a) 51°27´·027N., 0°20´·588E. 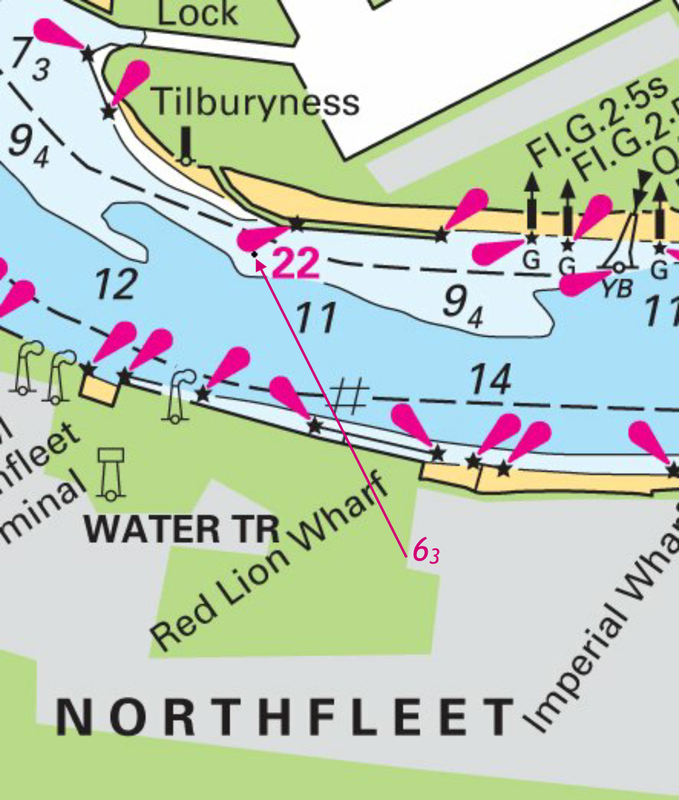 Small reduction in depth opposite Northfleet that should not trouble leisure craft. Notice 2120 - ENGLAND - East Coast - River Thames - Sea Reach - Depths. Dredged depth. depth 116 at 51° 30´·10N., 0° 37´·27E. depth 115 (a) at 51° 29´·06N., 0° 54´·23E. 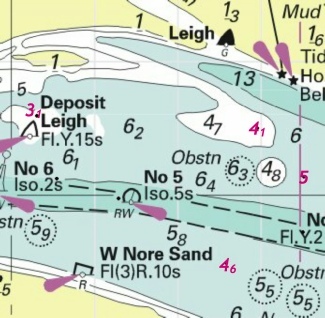 Amend legend to, Dredged to 12·0m (2013), centred on: 51° 30´·14N., 0° 35´·35E. Insert depth 116 (a) 51° 29´·06N., 0° 54´·42E. Insert depth 116 (a) at 51° 29´·06N., 0° 54´·42E. Amend legend to, Dredged to 12·0m (2013), centred on: 51° 29´·37N., 0° 50´·34E. UKHO Charts: 1185, 1186, 1607, 1609 and 2484. UKHO Leisure Folios: 5607.1, 5607.2. Two new depths that will not trouble leisure craft because of their depth and position in the middle of the Yantlet Channel. Notice 1493 - ENGLAND - East Coast - River Thames - Gallions Reach - Mooring buoy. Insert at 51° 30´·560N., 0° 05´·455E..
A new mooring buoy in Gallions Reach just off Margaret Ness. Image courtesy of Imray Charts and Meridian Seatrak ID10. Left click to enlarge; right click to download. 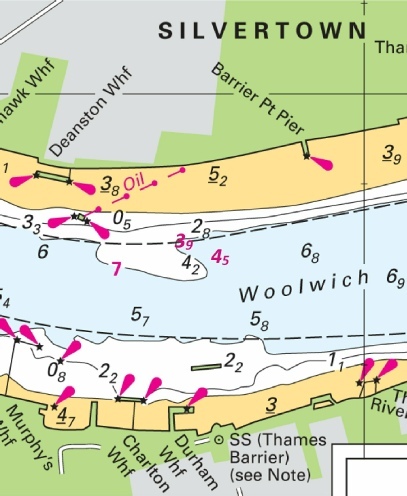 Notice 1326 - ENGLAND - East Coast - River Thames - Woolwich Reach Westwards - Depths. Insert depth 38 and extend 5m contour S to enclose (a) 51° 29´·804N., 0° 01´·541E. Insert depth 38 and extend 5m contour SW to enclose (a) 51° 29´·804N., 0° 01´·541E. UKHO Charts: 2484 and 3337. UKHO Leisure Folios: 5606.14 (Panel B). 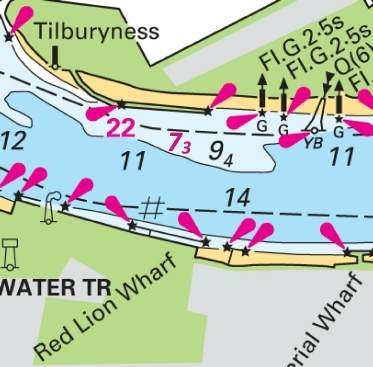 A reduction of depth off Hook Ness about a quarter of a mile up-river from the Woolwich Barrier. Do not confuse the figure ‘7’ in magenta as a depth. This indicates the position is 7nm from the head of ‘navigation’ for sea going ships which is London Bridge! 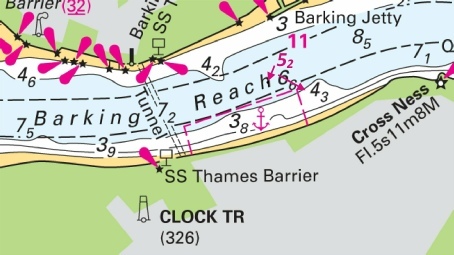 Notice 1327 - ENGLAND - East Coast - River Thames - Barking Reach - Depth. Insert depth 57 51° 30´·791N., 0° 06´·829E. 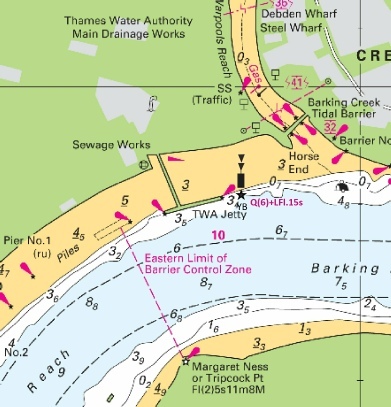 A reduction of depth in Barking Creek but unlikely to be of consequence to leisure craft. Notice 1357 - ENGLAND - East Coast - River Thames - Gravesend Reach - Diver Shoal Westwards - Depths. Insert depth 87 (a) 51° 26´·950N., 0° 23´·809E. A reduction of depth in the Diver Shoal, Gravesend Reach but unlikely to be of consequence to leisure craft. 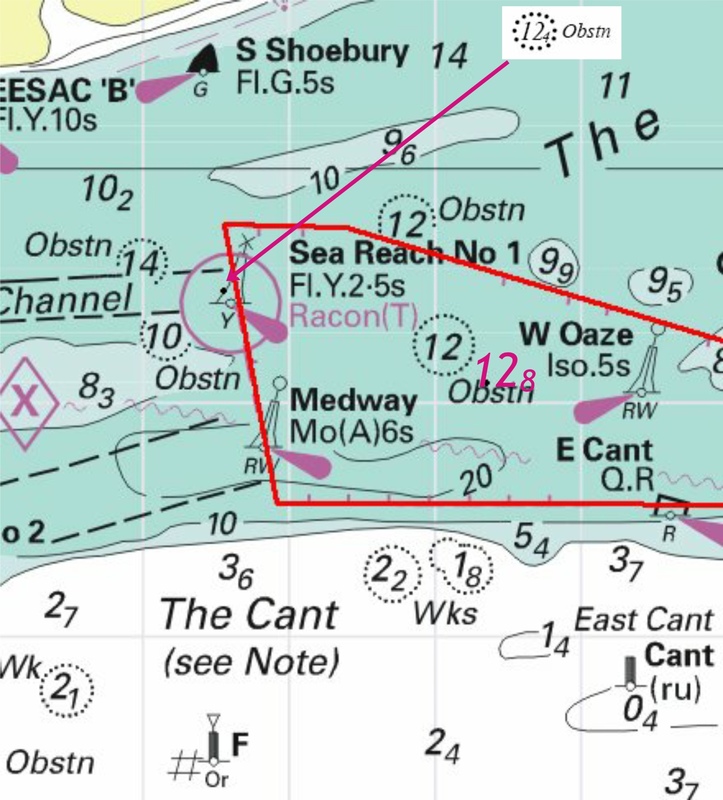 Notice 1008 - ENGLAND - East Coast - River Thames - Sea Reach - Yantlet Channel - Depths. depth 31 (a) at 51° 30´·59N., 0° 40´·31E. depth 41 at 51° 30´·50N., 0° 42´·95E. depth 5 enclosed by 5m contour 51° 30´·13N., 0° 43´·52E. depth 46 enclosed by 5m contour (b) 51° 29´·49N., 0° 42´·58E. UKHO Leisure Folios: 5606.7, 5606.8. 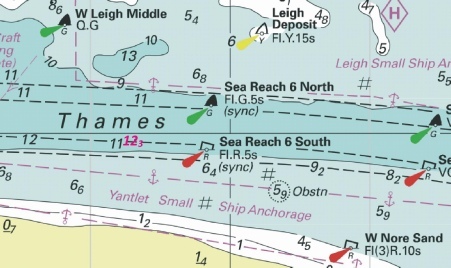 Four minor changes in depth either side of the Yantlet Channel off Leigh. Unfortunately this needs two chartlets to display! Images courtesy of Imray/Meridian ID10. Left click to enlarge, right click to download. Notice 551 - ENGLAND - East Coast - River Thames - Bugsby.s Reach - Depths. Insert depth 28 at (a) 51° 30´·24N., 0° 00´·54E. depth 28 at (a) 51° 30´·239N., 0° 00´·539E. depth 4 at (b) 51° 30´·203N., 0° 00´·587E. Images courtesy of Imray/Meridian ID10. Left click to enlarge; right click to download. Image courtesy of Imray/Meridian ID10. Left click to enlarge; right click to download.